Home Snowboard & Ski Goggles RayZor Black Framed Goggles With an Anti Fog Blue / Green Iridium Mirrored Vented Double Lens. 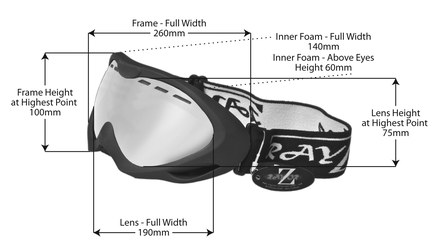 RayZor Black Framed Goggles With an Anti Fog Blue / Green Iridium Mirrored Vented Double Lens. UV400 Blue / Green Iridium Mirrored Anti Glare, Vented Spherical, Wide Vision Clarity Lens. The RayZor Blue / Green Iridium Mirrored Lens Provides Excellent Clarity in Bright, Clear and Sunny Conditions and it Reduces Glare. For what I paid very good value.I am a ski instructor but very rarely work in the Alpes now, mainly on UK slopes. For a week or twos holiday they are just the job!